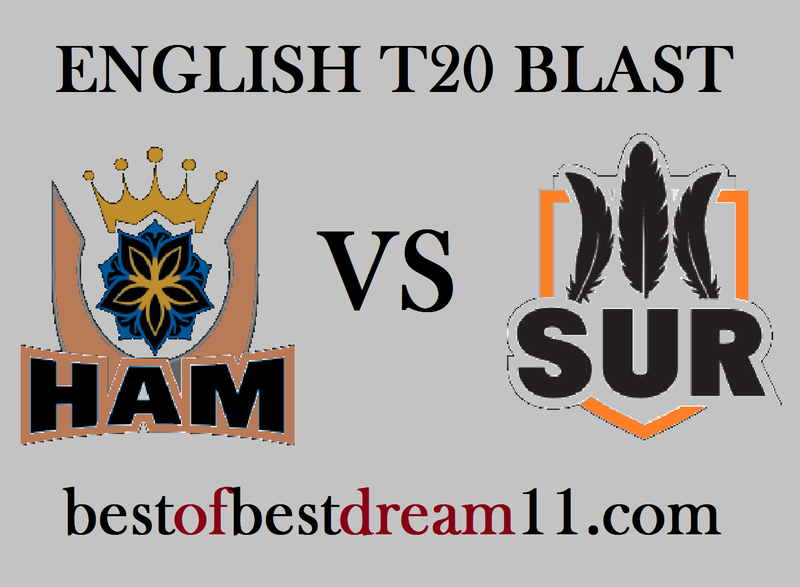 Here is best "HAMPSHIRE VS SURREY " ,South Group,English T-20 Blast 2018, DREAM11 Predictions for the Fantasy user ,who venue are looking to make a strong team for maximum win. We are providing latest news, match update, information about the match .The team is picked by using various factors on the basis of performance, ground stats and latest form. "The teams of Hampshire and Surrey will face each other on the field of Oval.Surrey's team performance has been mixed so far, he has been played 12 matches,out of which five have won. on the other hand ,The Hampshire team's condition is very bad,so far it has managed to win only one in 12 matches.Both teams are almost out of this tournament,in such a situation they would like to perform well in their remaining matches and would like to depart from this series." It is a sporting wicket,it will be very helpful to both the bowler and the batsman. for Surrey,Ben Fokes has done very well for his team so far, in the last match too he has played a wonderful innings of 59 runs (39 balls). Ricky Bells has performed a spectacular all -round performance in this series. in the last match ,he scored 35 runs and also took two wickets. Nic Maddinson , J Roy and Will Jacks also the key players . in bowling ,in the previous match,Morne Morkel grabbed 3 wickets while bowling well. for Hampshire,Rossow and J.Vince are in good form and till now they have given their team a good start. Sam Northeast,Tom Alsop and L Dawson will have to play play a responsible innings. Chris Wood and Mujeeb Ur Rahman are the key bowlers for his team.